Tomorrow is St. Patricks day! Can you believe it's already here? I feel like this year has already come and gone and all the fun plans for each and everyone of my holidays has been put on the back burner because we have just been so busy with regular life. My husband is headed out of town tomorrow so my plans on cooking the traditional corned beef and cabbage is not going to happen... I can not eat all that food by myself and my kids still eat tiny portions. Left overs it is! I decided to celebrate tonight by making some Irish Soda Bread. 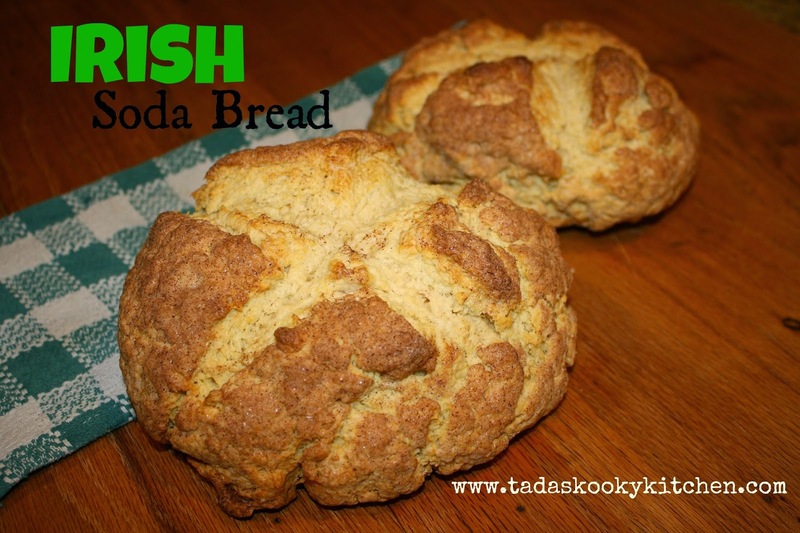 It's soda bread because it has baking soda and buttermilk instead of the normal yeast used in bread. And what makes it a traditional 'Irish' soda bread is the caraway seeds and the raisins or currents added into the bread...( you can probably tell that I did not have any of those 3 things on hand tonight but next year I'll do better!! Right?... hopefully?... Hey at least I did something for a holiday that is for the Irish when we have not even a hint of Irish blood in us... Sadly because I would love to have a sign that says 'Kiss me I'm Irish' , But I'm not. So I guess I'm out of Luck. haha..luck.) I'm tired. can you tell by the rambling? Anyway back to the recipe. In a large bowl combine the flour, sugar, baking powder, baking soda, and salt. Cut in the shortening with 2 butter knives (or a pastry cutter) until mixture resembles coarse crumbs. Stir in the raisins or currents and the caraway seeds. Combine buttermilk and egg; add to crumb mixture. Turn onto a lightly floured surface and knead gently 5 or 6 times. (be careful not to handle the dough too much or it wont be as flaky as you want it) Divide dough in half; shape into two balls. Place on a lightly greased baking sheets and pat each ball into a round loaf, about 6in. Using a sharp knife, cut a 4in cross about 1/4in deep, on top of each loaf. brush with the melted butter and sprinkle with cinnamon and sugar mixture. Bake at 375* for about 40 minutes or until golden brown.